For people who know something about the Bible, the Book of Revelation really is intriguing. Most people expect that it reveals some very important things about the future… and it does. Yet for many, the book remains a mystery because there is so much symbolic language and situations that are hard to understand and put together – a scroll with seven seals, seven angels blowing trumpets, bowls of wrath poured out upon the earth – what does it all mean? The Book of Revelation was not written to confuse us, but rather to bless those who read it. 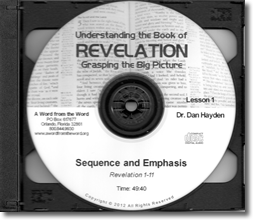 In two powerful sessions, Dan explains the sequence and emphasis of the book in terms that every Christian can understand.